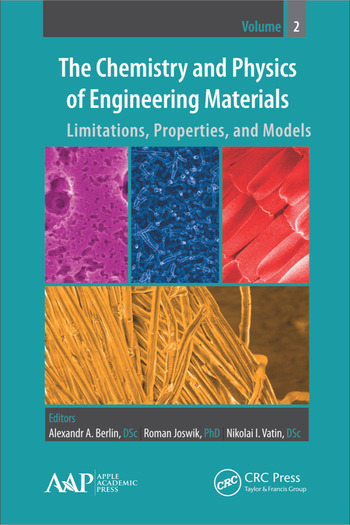 This new volume focuses on the limitations, properties, and models in the chemistry and physics of engineering materials that have potential for applications in several disciplines of engineering and science. Contributions range from new methods to novel applications of existing methods. This volume is also sold as part of a two-volume set. Volume 1 focuses on modern analytic methodologies in the chemistry and physics of engineering materials. V. A. Babkin et al. G. А. Korablev et al. G. E. Zaikov et al. F. B. Shevlyakov et al. R. N. Khusnitdinov et al. Alexandr A. Berlin, DSc, is Director of the N. N. Semenov Institute of Chemical Physics at the Russian Academy of Sciences, Moscow, Russia. He is a member of the Russian Academy of Sciences and many national and international associations. Dr. Berlin is world-renowned scientist in the field of chemical kinetics (combustion and flame), chemical physics (thermodynamics), chemistry and physics of oligomers, polymers, and composites and nanocomposites. He is a contributor to over 100 books and volumes and has written over 1000 original papers and reviews. Roman Joswik, PhD, is Director of the Military Institute of Chemistry and Radiometry in Warsaw, Poland. He is a specialist in the field of physical chemistry, chemical physics, radiochemistry, organic chemistry, and applied chemistry. He has published several hundred original scientific papers as well as reviews in the field of radiochemistry and applied chemistry. Nikolai I. Vatin, DSc, is Chief Scientific Editor of Magazine of Civil Engineering and Editor of Construction of Unique Buildings and Structures. He is also a specialist in the field of chemical technology. He published several hundred scientific papers (original and review) and several volumes and books.